Those of you who have been reading this blog for a while, know that I have a little bit of a “thing” for men’s underwear. There are now 6 posts solely dedicated to men’s briefs on Run Oregon. We invented mens underwear with an adjustable pouch that comforts and supports your manhood. The idea for adjustable pouch underwear came about because men’s underwear has not been revolutionized in centuries. Underwear, Boxer briefs, tighty whities, the jockstrap and compression shorts have all tried to offer comfort and support, but men usually have to settle for comfort or support. 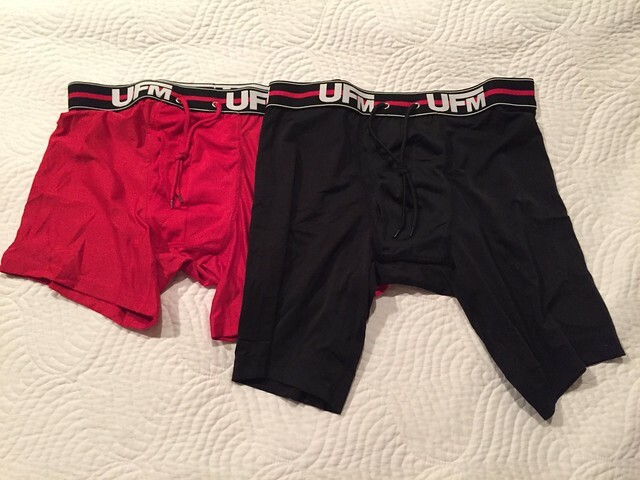 Mens underwear companies have attempted to innovate in the market, but none have come close to quality and performance found in UFM Underwear For Men. UFM Underwear was launched in 2013 with a Kickstarter campaign to see if there was a need for the product and to help fund the start of our mens underwear adventure. Men’s underwear is definitely going the way of the pouch. More and more companies are adding in a little extra room near the front in an effort to increase comfort and regulate temperature. I have tried and review a few in the past, and am becoming more and more used to them. UFM has taken this idea and taken it up a notch with its adjustable drawstring pouch. I’ll be honest, at first glance I wasn’t sure how these would feel. They looked great, but a drawstring…on underwear? Surely that’s not going to work as envisioned right? Actually not so! The drawstring action allows for the right around of support up front and keeps it in place. I even remarked to my wife how surprisingly comfortable they are. She rolled her eyes. Regardless of that, I really like these. I wore them on a run and they really held up as well. They are much softer than the spandex compression shorts many of us wear, given their newly revised design. They come with 2 material options (90% Poly/10% Spandex – which I received) and Bamboo/Spandex) as well as 3 color choices. In fact, UFM is working to get in front of more runners and they recently exhibited at the Gate River Run in Florida and will be at The Runner’s Expo this November at the Orlando Convention Center. I think they have a good future ahead of them. Vaporactive, powered by 37.5 technology, is infused with naturally derived active particles embedded at the fiber level. These particles use the body’s naturally occurring infrared energy to rapidly attract, capture and evaporate moisture – keeping you cool, dry and comfortable. Unlike wicking performance fabrics that just move the sweat around, revolutionary Vaporactive rapidly attracts and removes the sweat from the body – keeping you cool, dry and comfortable. Mission is one brand that I have known about for quite some time. Some of my favorite and longest lasting items in my running closet are some towels that I must have purchased 5+ years ago. Mission is still going strong, but have been keeping up with the changing times by improving their technology in this arena. You can read about the Vaporactive technology above, because its way above my head. Active particles? Infrared energy? Dang, remember when cotton tighty-whities were all that we had? I’ll just keep things simple and let the technology speak for itself. All-in-all, I found these to be very comfortable, especially those of us who are most familiar in wearing and running in compression shorts or boxer briefs. They held up really well during some really warm runs this past month – seemingly staying more dry than usual. I am guessing that this probably has something to do with the construction – as their Vaporactive line moves away from moisture-wicking (to disperse sweat) and into removing the sweat entirely. It’s not like I was completely dry afterwards, but the difference was a bit noticeable, especially over some of my older and less technologically advanced pairs (that will soon be retired from my closet). Stay on the lookout for a future review on other items from Mission and their Vaporactive line.